I am excited to announce that I have joined a new recipe group “The Recipe ReDux.” On the 21st of each month I will be creating a new recipe based on that months theme. 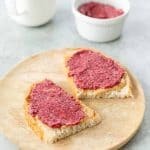 The best part about these recipe challenges is that it introduces you, the reader, to more healthy cooking blogs! This months theme was grilling. 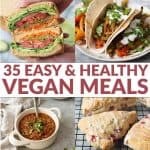 As a plant-based girl, my mind went to grilled summer vegetable salads, grilled cesear salad (got a spin on that coming soon) and grilled fruit salad. Ah, my favorite summer treat- grilled fruit. If you’ve ever had grilled fruit then you know the love affair I am speaking about. Smoky, warm, caramelized fruit , delicious with vanilla ice cream or on its own. Heat grill or grill pan to medium-high heat. If using a grill, oil a paper towel and rub on the grill crate to keep the fruit from sticking. Alternatively, you can lightly brush oil onto the bottom side of the fruit to prevent sticking. If your pieces are very small, you can use a grill basket. 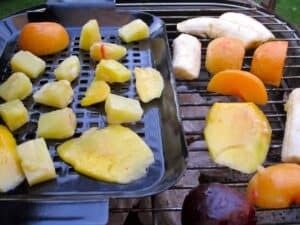 Place the fruit cut side down onto the grill and cook for 5-7 minutes. The peaches, plums, pineapple and bananas will take the longest to cook. The mango heats up pretty quickly because it is so thin so you will want to take it off before the other fruits. While the fruit is on the grill, combine the ingredients for the sauce. Use good quality balsamic vinegar here if you have it, you could also use an infused variety. 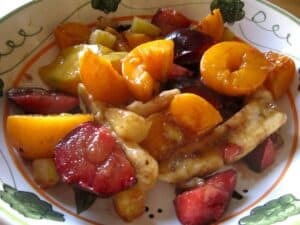 While the fruit is still warm, dice into bite size pieces (you can also leave whole and cut while you are eating it) Drizzle the grilled fruit with the sauce and serve immediately. Other options: serve with a dollop of whipped cream, in crepes, or over ice cream/sorbet. Thanks all! I am excited about the Recipe Redux challenges as well. I love the idea of having leftovers on waffles or pancakes the next morning. Love the sauce for your grilled fruit. Balsamic vinegar combined with the sweet favor of cinnamon, maple syrup and vanilla — sounds like it could be used for lots of great dishes! Thanks! I LOVE grilled fruit… and agree that in a crepe would be divine. All the reason to grill extra and have a special bfast the next day! fantastic idea! i love unexpected things on the grill… not to mention the balsamic in the sauce. well done!